Now that Google has announced that Python 2.7 is fully supported on Google App Engine, I figured I should get my act in gear and make convert LibraryHippo over. I'd had a few aborted attempts earlier, but this time things are going much better. One of the requirements for moving to Python 2.7 is that the app must use the High Replication Datastore, and LibraryHippo did not. Moreover, the only way to convert to the HRD is to copy your data to a whole new application. So I bit the bullet, and made a new application from the LibraryHippo source. When you set up a new application, you have the option of allowing federated authentication via OpenID. I'd wanted to do this for some time, so I thought, "While I'm changing the datastore, template engine, and version of Python under the hood, why not add a little complexity? ", and I picked it. I wanted to minimize my headaches - I figure, if an organization supports both an OpenID client feature and an OpenID provider, they must work together as well as any other combination. That sounded pretty good - the existing application didn't use login: required anywhere, just create_login_url (without a federated_identity, of course). So, LibraryHippo should be good to go - every time create_login_url is used to generate a URL, it'll send users to Google Accounts. I tried it out. 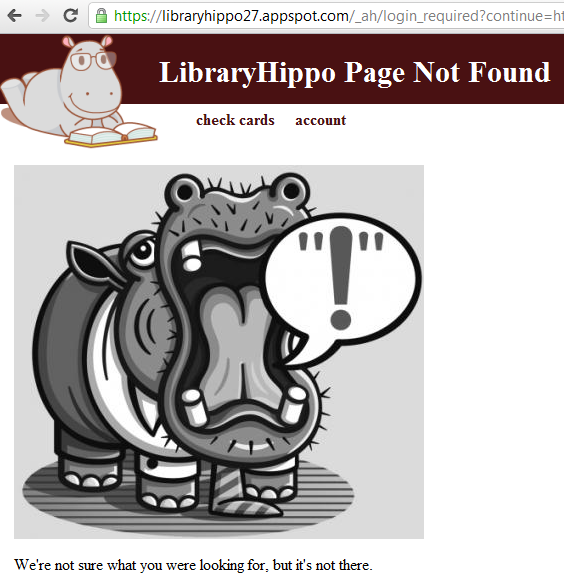 After providing her credentials, the user was redirected to a page that asked her if it was okay for LibraryHippo to know her e-mail address. After that approval was granted, it was back to the LibaryHippo site and everything operated as usual. However, login: admin is still a problem. I really shouldn't have been surprised by this, but login: admin seems to do the same thing that login: required does - redirect to /_ah/login_required, which is not found. This isn't a huge problem - it only affects administrators (me), and I could workaround by visiting a page that required any kind of login first, but it still stuck in my craw. Fortunately, the fix is very easy - just handle /_ah/login_required. I ripped off Nick's OpenIdLoginHandler, only instead of offering a choice of providers using users.create_login_url, this one always redirects to Google's OpenId provider page. With this fix, admins are able to go directly from a not-logged-in state to any admin required page. With the above solution, LibraryHippo's authentication system has the same functionality as before - users can login with a Google account. It's time to add support for other OpenID providers. I added a custom provider picker page as Nick suggested, and tried to login with my myOpenID account, with my vanity URL as provider - blair.conrad.myopenid.com. The redirect to MyOpenID worked just as it should, and once I was authenticated, I landed back at LibraryHippo, at the "family creation" page, since LibraryHippo recognized me as a newly-authenticated user, with no history. Buoyed by my success, I tried again, this time using the "direct provider federated identity" MyOpenID url - myopenid.com. It was a complete disaster. Interestingly, both Yahoo! and WordPress work, but StackExchange does not. If it weren't for Yahoo!, I'd guess that it's the direct provider federated identities that give App Engine problems (yes, Google is a direct provider, but I consider it to be an exception in any case). For now, I'm going to use the simple "just Google as federated ID provider" solution that I described above. It seems to work, and I'd rather see if I can find out why these providers fail before implementing an OpenID selector that excludes a few providers. Also, implementing the simple solution will allow me to experiment with federated IDs on the side, since I don't know how e-mail will work with federated IDs, or how best to add federated users as families' responsible parties. But that's a story for another day.